Are you struggling to find suitable maternity clothes for work? Are none of the clothes in your closet comfy and stretchy enough for your growing baby bump? Let’s all be honest here. If we could rock up to work in our sweats and casual clothes, we would. But we all know that offices don’t work like that, even when you’re pregnant. So, it’s time to shop for some smart maternity clothing that’s going to be suitable for work. This guide can help you know what to look for, and we’ll share some of the fantastic styles out there. 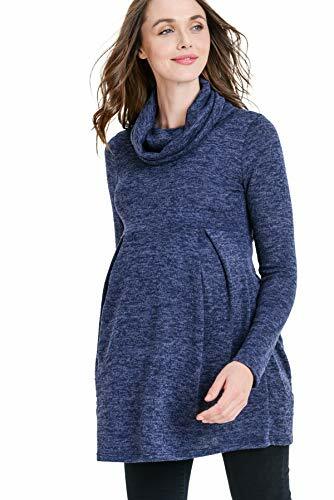 Use the links above to check the latest prices or read our in-depth maternity work clothes reviews below. Not all the maternity clothing out there is going to be appropriate for the office. Of course, the style that you go for will be down to personal taste. Whether you can go for something smart-casual will also depend on the environment you work in. Here are a few things you should consider when you’re choosing maternity work clothes. With a growing belly and changing body shape, the last thing you need is clothing that aggravates your skin. This is especially true when you’re working. You want to look out for soft materials that are going to be comfortable. This includes cotton, which is breathable and soft (source). In addition, rayon and polyester will be gentle against the skin. You want to enjoy the freedom of movement while you’re at work, particularly if you’ve got an active job. So, look out for stretchy fabrics. Rayon in particular is good for free movement. Stretchy material is going to be accommodating throughout your pregnancy and ensures comfort around that growing baby bump. In addition, some clothing will include spandex (source). When shopping, make sure to check the labels. If you’re in a cold office or it’s winter time, you need warm fabrics for comfort. Your best bet for this scenario is to layer up. Get a comfy, yet warm, cardigan or soft jacket to throw over your bottom layer. On the other hand, summertime apparel needs to be loose, breathable, and cool. If there’s one thing that’s annoying about pregnancy, it’s buying clothes only to never wear them again. So, look out for versatile clothing that can also be worn after you’ve given birth. 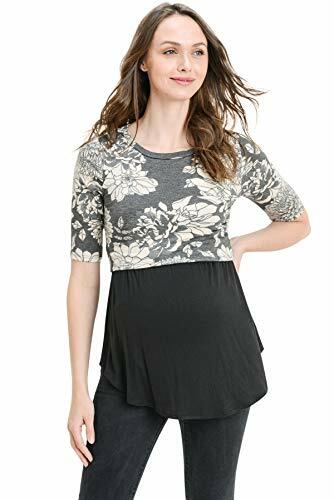 For example, a lot of maternity clothing has fantastic postpartum features that make nursing easier. This includes lift-up flaps and easy access to layers underneath. It’s time to look at some of the best maternity work clothes we could find. Whether you work in an office, a doctor’s surgery, or you’re on the go, we’ve got something for you. This midi dress is all about comfort, yet it’s also trendy and in style. It has long sleeves with a v-neck for a modest design. It also has ruched sides, which allows for a growing baby bump. What makes this dress great is that it’s made from 95 percent cotton. This means it’s incredibly soft and comfortable against the skin. It’s also hypoallergenic and insulating, which will keep you warm in the office. It’s recommended that you choose one or two sizes up when you’re pregnant. This will allow for a comfortable fit. We love that there are lots of colors to choose from. This knit sweater is going to be great for nursing after your baby is born. There’s a front layer that opens to make nursing more convenient. The long sleeves can keep the chills at bay, while it’s made from 95 percent rayon for a soft and stretchy fit. The good thing is that there are some beautiful colors to choose from, including some cute plaid variations. Do you ever feel like maternity clothes aren’t the most fashionable? Even when you’re in the office, you want to feel confident and enjoy your own style. This peplum top allows for a smart-casual style with a paisley pattern. It features a scoop neck and three-quarter sleeves. It’s not clingy either, which means you can also wear this top later on in pregnancy. Over 30 other patterns are available if paisley isn’t your thing. If you’re allowed to wear relaxed and comfortable clothing to work, check out this button-down shirt. It’s made from 95 percent polyester, which is stretchy and breathable for wearing all day. A casual and relaxed style, with vertical stripes, this can be good when you’re near the end of your pregnancy and still working. The stripes may also be slimming. The three-quarter sleeves are stylish, with a button allowing you to wear them up or down. 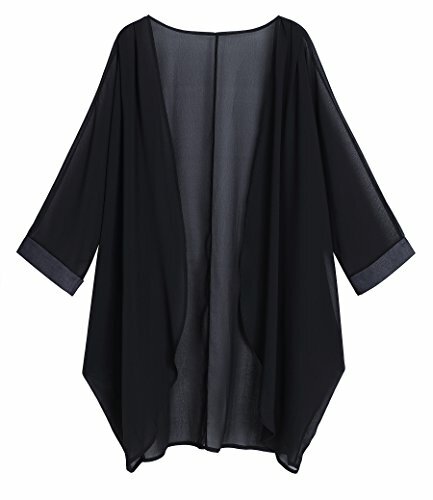 It has a round neck and two-button fastening. The curved hem means you can wear this without tucking it in and the pull-on closure makes getting dressed while pregnant easy. Other colors and patterns are available. 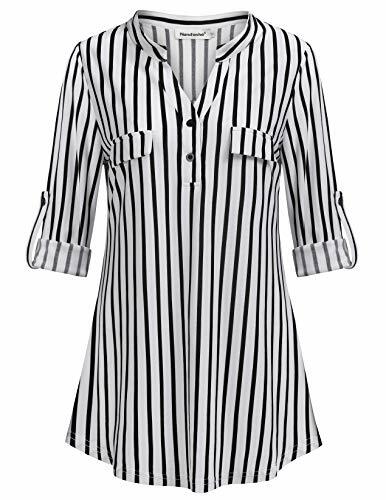 Stripes are often worn by women so they appear slimmer and taller. 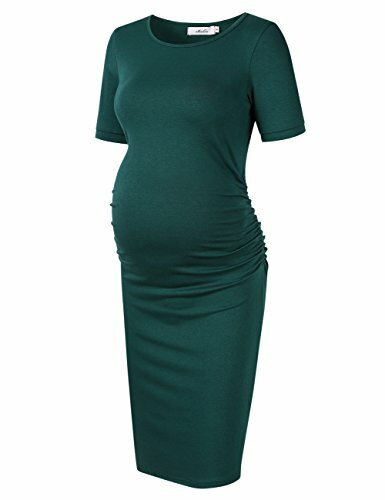 If you want to show your baby bump, but also not feel huge, this may be the dress for you. It has two panels of diagonal black and white lines, with horizontal stripes around the legs. Choose 1-2 sizes up from normal for maternity wear. This dress is 95 percent rayon, machine washable, and comes in five color choices. A lot of workplaces now allow casual wear to be worn at least once a week. If this applies to you, why not consider this casual, but stylish, tee? It enjoys the classic baseball style that everyone loves, in an attractive navy color, while other color options are available. Several sleeve options are also available: short, three-quarter, or long. It’s easy to move around in and not too tight around the belly, and there’s ruching, which allows some stretch just where you need it. The T-shirt is made from 95 percent rayon and is machine washable, using cold water with a mild detergent. This pull-on sweater is just what you need for everyday work in a smart-casual office. It has long sleeves to provide warmth, as well as a cowl neck. It’s a simple design, but one that still looks contemporary. Importantly, it has a loose fitting style so it feels airy and free. Would you prefer something other than navy? Don’t worry, there are plenty of colors to choose from in this style. Looking for a classic dress for a formal workplace? This one is going to look gorgeous and flattering while you’re pregnant. It’s made from 95 percent rayon, which provides stretch and a soft feeling against the skin. 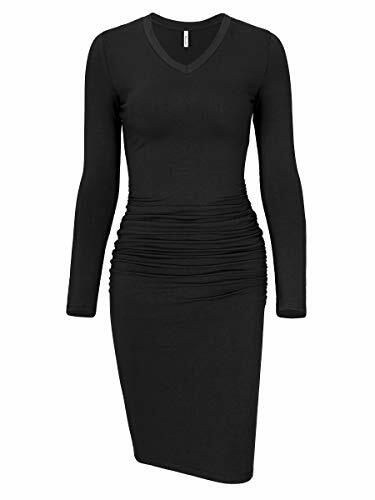 You can enjoy a round-neck, knee-length style that is appropriate for offices, with a bodycon fit and ruching down the sides. Of course, the ruching is perfect for a growing belly. We love the burgundy color. But you’ll find a lot of other beautiful colors too, such as dark green and royal blue. If you work in a cold office, or even outdoors, you may be looking for a long-sleeved top. This one is going to keep you cozy. You’ve got the long sleeves, as well as a stylish cowl neck to keep the back of your neck warm. This top is made from 95 percent rayon and you can select from six fashionable colors. 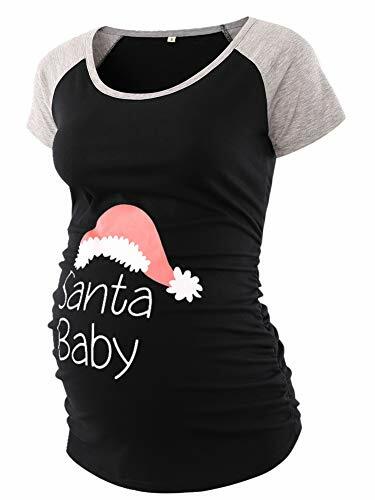 This top has an empire waist, which starts underneath the bust and can have a slimming effect, even while you’re pregnant. The pull-on closure will make it a breeze to throw on when you’re running late for work. There are many different colors and patterns you can choose from. Don’t forget to check out the hidden front layer on this one, for postpartum use. You simply lift this, which makes nursing simple when you’re out and it’s feeding time. Finding smart pants that are comfortable can be one of the biggest struggles when you’re pregnant. If you still need to dress formally for your job, these black pants can help you look the part. The best bit is that they feature a seamless stretch panel for your growing belly. They’re made from 77 percent rayon and are machine washable. If you’d prefer not to wear black, there’s also khaki, navy, white, and grey. If there is one thing that never goes out of fashion, it’s polka dots. This fun and stylish shirt is cream with black polka dots, which are lovely neutral colors for an office. What’s more, the pleated design is simple yet contemporary. This shirt is super soft and comfortable to wear during your shift. It’s machine washable on a cold cycle. Don’t like polka dots? Choose from numerous other colors and patterns. If you have a medical or practice job, then scrubs are a must. With these scrub pants, you can be prepared. They’re in the classic, straight leg scrub style, and allow freedom of movement since they’re designed from a mixture of polyester, cotton, and spandex. Being mid-rise, they can be positioned over your bump for support, and the soft rib panel provides coverage. It also expands to grow with your belly. There are two super useful pockets for any equipment you need to carry. 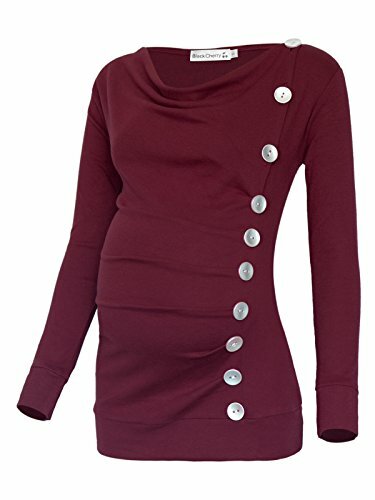 If you like to show off your baby bump, you’ll be able to do it in style with this dress. 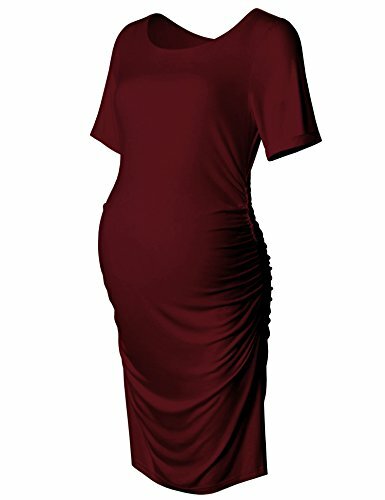 This bodycon shape really shows off your figure. The ruched style is ideal for a growing belly. This dress has short sleeves, a round neck and a longer, knee-length style that’s appropriate for the office. This is a solid color but if you’d prefer a patterned dress, there are some fantastic ones in this style. 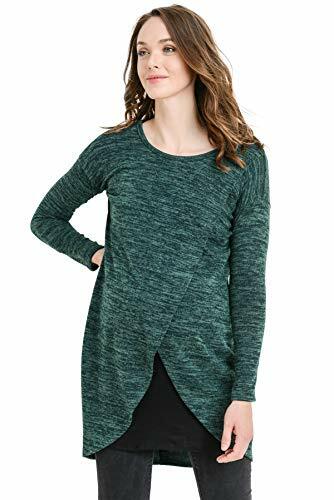 This tunic has long sleeves to retain heat, beautiful decorative buttons down the side and a fashionable and comfortable cowl neck. Being 95 percent polyester, this style is comfy but smart enough for most offices. 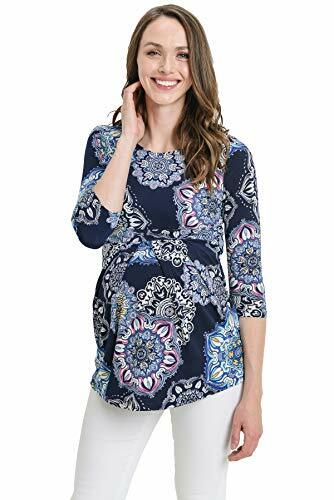 What’s more, the top three buttons of this tunic can be undone, allowing you to enjoy wearing it after birth to make nursing your baby easy. Choose from a selection of colors to create your favorite maternity outfit. 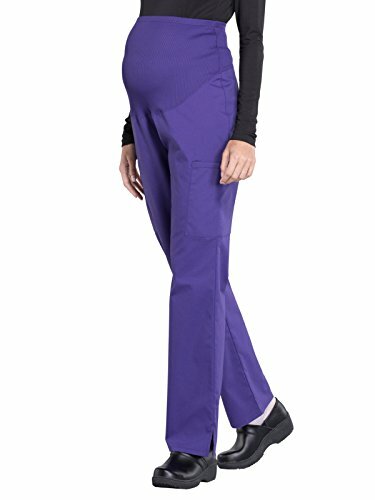 Whether you’re a nurse or veterinary technician, this is the scrub top you need when you’re pregnant. It’s a mock wrap style, with stretch side panels to keep your belly comfortable. It’s made from 65 percent polyester and 35 percent cotton, which means a good mixture of softness, durability, and less shrinkage. It’s going to give you a good range of movement for the practical work you do. Several stylish colors are available. Do you like to have a removable layer at work? Well, we’d suggest this stylish kimono cardigan. This is going to provide some insulation to the body and arms, and likely become an essential part of most outfits. The loose and flowing fit is great for when you’re pregnant and the bat sleeves allow plenty of movement. It’s made from a mixture of polyester, chiffon, and lace, for a soft finish. We love that there are so many colors to choose from. You can find a cardigan for every season and to suit any outfit. If we had to choose a favorite, it would be the Missufe midi ruched dress. We love this trendy style and the fact it’s made from warm and soft cotton. It’s all about comfort, while still feeling confident and fashionable at the same time. Work is probably the last place you want to be right now. But at least if you’re comfortable and you know you look good, it won’t seem so much of a chore. Do you have a favorite from our list of maternity work clothes? Leave us a comment below and tell us what you think. What are the Best Maternity Belts and Belly Bands? What are the Best Maternity Compression Stockings?